I am in no hurry to make a return to collecting cardboard – the passion that I had decades ago for this particular hobby is no longer within me. I have never sold or disposed of any of the cards that I previously collected. I still possess all of the 1950s, 60s and 70s cards and I recently retrieved them from my storage location when I was writing an article a few months ago (see: Progression From Cards to Photos; Seeking Imagery of those with Service). With the direction that my interest in ballplayers who served in the armed forces (including service members who played the game while the served), I have been acquiring artifacts ranging from uniform elements, game equipment, scorecards and programs, baseball-specific medals and awards as well as vintage photographs. Needless to mention, I love the imagery of the game itself. My baseball roots have lengthy reach – in my youth, I would enjoy the nationally-televised Game of the Week (on Saturday) or the prime-time games televised on Monday Night Baseball (recalling Curt Gowdy‘s broadcasts with part-time announcer, Maury Wills for the NBC offerings and baseball broadcasting legend, Bob Uecker‘s calls leading ABC’s three-man television team), rarely missing a Red Sox or Dodgers game when they were featured. In the absence of local major league baseball, these two highly successful franchises and the players filling their rosters were intriguing to me. Perhaps post-season futility or their propensity to be underdogs to the juggernauts of the Athletics, Reds and Yankees of those eras are what drew me to being a fan of the Los Angeles and Boston teams and those allegiances remain nearly 50 years hence. My Pesky-estate photograph-find landed three fantastic original type-1 photographs into my collection. Owning a photo with both Pesky and Ted Williams in their Navy baseball uniforms satisfies my desire to possess a well-rounded archive that includes the stars of the game who served and played along side the men who joined who came from other (than sports) walks of life to serve the country. When I collected cards back in the old days, I wasn’t one for attempting to complete an entire set by a maker (with numbers in some years exceeding 3-400, that challenge can get quite expensive depending upon the set and the ball players’ cards it contains) but would be more inclined to obtain to create my own sub-set (of cards from a specific year and manufacturer) from one of my favorite teams. One such sub-set (my 1956 Topps Brooklyn Dodgers team set) posed a bit of a challenge as it we was filled with stars who were in the prime or just beginning their Hall-of-Fame careers. 1959 Fleer Ted Williams #20 – One of my favorites of the set, “1942-On To Naval (Training)” shows Ted seated in a Piper Cub that was snapped during a December 1, 1942 publicity photoshoot at Amherst College with Johnny Pesky. 1959 Fleer Ted Williams #21 – Following his MVP-snub in 1941, Williams was awarded a similar award in 1942. This card, “1943-Honors For (Williams),” shows his award and that he was just days away from setting aside his baseball career for Naval Aviator training. 1959 Fleer Ted Williams #22 – “1944-Ted Solos” captures William’s first time soloing in an aircraft while in training at his flight school in Amherst, MA. 1959 Fleer Ted Williams #24 – As with his accuracy with batting, Williams excelled in aerial gunnery proficiency setting records at his assigned commands. This card, “1945-Sharpshooter,” focuses on his non-combat achievement. 1959 Fleer Ted Williams #25 – Shown in the seat of a F4U Corsair, “1945-Ted Is (Discharged)” brings to a close, William’s WWI service depictions. Interestingly, my pursuit of cards back in those early collecting years didn’t include many featuring Ted Williams. Even in those days, the “Splendid Splinter” seemed to be in high demand and his cards were expensive. My limited financial means would drive me down the path of least resistance and source only what was (then) affordable. Considering that when I discovered the 1959 Fleer Ted Williams card set, I was at the tail-end of my collecting focus, I managed to acquire a few of the very inexpensive cards that depicted Williams’ military service. 1959 Fleer Ted Williams #47 – Titled, “1953-Ted Crash (Lands Jet)”, this card depicts William’s Grumman F9F crash-landing following receipt of enemy ground-small arms fire. 1959 Fleer Ted Williams #48 – Titled, “July 14, 1953-Ted (Returns),” Williams returns from the Korean War in time to throw out the first ball in the ’53 All-star game. Motivated by the recent string of acquisitions and the emphasis that has unintentionally been centered upon Navy baseball (including within the Pacific Theater), I started to check on availability and the prices of the Williams 80-card set. Professional Sports Authenticator (PSA) describes the Williams set as telling “the story of one of the more interesting individuals to ever walk onto the field. From fishing to military duty, the cards cover a variety of subjects.” I zeroed in on the eleven cards that deal specifically with William’s military service (card numbers 20-25 center on his WWII training and service while his return to fight in the Korean War are covered in numbers 44-48). The eleven-card subset features color-toned black and white images taken from various moments in Williams’ military service on each obverse and a brief, contextual description on the reverse. Of these cards, I already owned numbers 23, 25 and 46. As the cards (in similar, ungraded condition) are relatively inexpensive, I moved ahead with purchasing a few more (20-22, 24, 47, and 48) in order to get closer to completing this subset. With only two outstanding cards, I am certain that I will have no challenges in landing the final two, thereby concluding my non-return to baseball card collecting. Duke Snider’s 1956 Topps baseball card. Harold “Pee Wee” Reese’s 1956 Topps. The 1956 Gil Hodges Topps card. The reverse of Snider’s ’56 has no mention of his military service. The back of Pee Wee Reese’s 1956 Topps. Gil Hodges’ 1956 Topps card. Gil Hodges’ 1957 Topps card. Following the ’56 set, these seemed a bit more plane but they included the player’s full major league statistics. Many years ago, before I discovered the enjoyment of gathering and researching baseball artifacts that were used by ball-playing service members, I was very interested in baseball cards from the 1950s and early 1960s. For some reason, I was taken by the 1956 Topps cards in particular due to the landscape-orientation of the images and the hand-tinting of the players’ photograph and the “comic strip” artwork and factoids that were presented on the card backs (above the individual’s playing stats which included the previous season and the career totals). Even at that time, these cards were already highly collectible and commanded significantly higher prices than their contemporary counterparts. Nevertheless, I decided that I wanted to take a more “affordable” approach and collect the cards of the Brooklyn Dodgers as that team was the reigning world champion and whose roster was still stocked with the core players who helped bring their organization its very first title (and last, in that city). The 1957 Topps card for Gil Hodges shows his service in the Marine Corps in 1944-45 before resuming his career with the Dodgers after the war. While pursuing the ’56 Brooklyn set, I began widen my interests for certain players and purchased their cards from other years (cards issued previous and subsequent to 1956). When I landed a few players’ cards from the 1957 Topps set, I noticed that the player’s statistics encompassed their full career, broken out by each year on separate lines and totaled at the bottom. Though I owned a Major League Baseball (MLB) Encyclopedia and was thoroughly familiar with many of my favorite players’ career statistics, it wasn’t until I held a card in my hand that a particular statistic stood out to me. In 1957, Gilbert “Gil” Raymond Hodges played a single game of major league baseball with the Brooklyn Dodgers in 1943 which was reflected by a single line; he had only two at-bats* and did not get a hit. For the next two seasons, his ’57 card lists that though he was still a Brooklyn Dodgers player, he did not play for the team as he was “In U.S. Marine Corps.” As I looked through other cards, I saw similar statistics for other players. 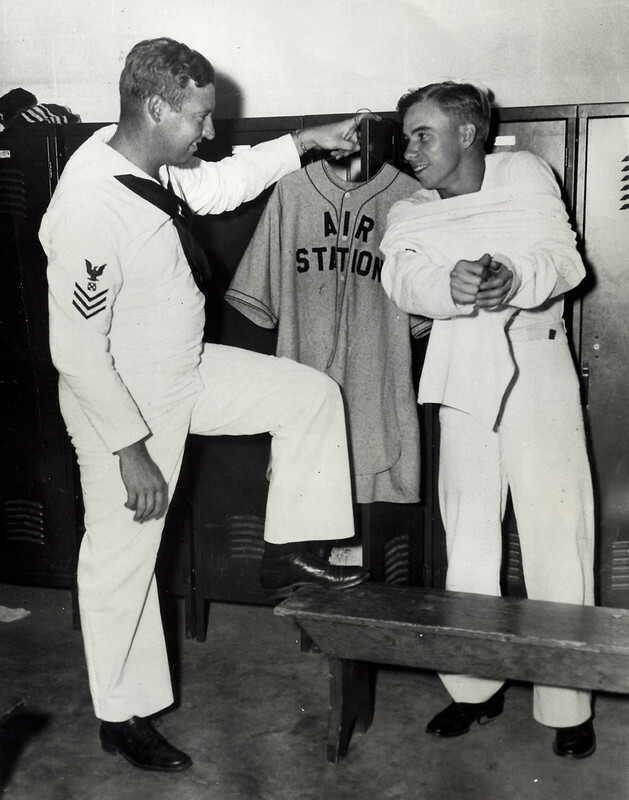 Dodgers Hall of Fame shortstop, Harold “Pee Wee” Reese had the same information though he was “In U.S. Navy” but he had three previous seasons in a Dodgers uniform. When I began to pay attention to the information pertaining to players’ service during the war, I was past the mid-way point of my own military career. My interest in collecting baseball memorabilia waned after the 1994 strike shortened the season and for the first time in MLB history, stripped fans of a World Series (which was ultimately cancelled). Admittedly, I was excited by the Seattle Mariners magical 1995 season and their first appearance into the playoffs and being there for their clinching game of the American League Division Series followed by Game 1 of the Mariners’ first American League Championship Series. Despite the excitement that I personally experienced, I still discontinued all collecting interests until I was reignited with a passion for military history more than a decade later. Pictured here with a few unrelated artifacts is my very first military baseball piece, a 1943-44 USMC baseball uniform. Fast forward to 2009-2010 when I acquired my first military baseball artifact (a 1943-44 Marine Corps red-trimmed, road gray wool flannel baseball uniform) which re-ignited my baseball collecting interest, focusing entirely upon those who served in the armed forces and played the game. Not long after obtaining the first uniform, I discovered a second Marines jersey (made of red-canvas, yellow-trimmed from the same WWII-period) that I added to my collection. I recalled one of my favorite players (the aforementioned Gil Hodges) and that he served in the Marines during WWII and couldn’t help but imagine him wearing one of the two uniforms that I had in my collection. When I started searching the internet in hopes of locating any photographs of him during the war, I stumbled upon auction listings photos of Marines wearing baseball uniforms. I began to pursue and started collecting these and similar vintage photos of service members playing the game, posed in team settings or just having a catch while away from the hazardous duties of armed conflict. This is most-likely a domestic USMC team that played in the Government League in 1915. Regardless of the branch of service, I continued to expand my collection of uniforms, ephemera (such as scorecards and programs from service team games) and photographs. After several years of collecting, I am seeing an unintended trend within my collection. The majority of my pieces are Marine Corps-centric which is somewhat humorous considering my naval service and the nature of the intra-service rivalry (and brotherhood) shared between personnel within both branches. Aside from the two iterations of the jerseys/uniforms previously mentioned, I subsequently located a third wartime USMC jersey and two Marines ball caps. The photos that have found their way into my collection date as far back as 1915 (some in Latin America) through China in the 1920s and 30s and into World War II. Some speculate that the Marines introduced the game to the locals while they were in country on Santo Domingo in 1916. If they didn’t bring the game there, the Marines certainly influenced the locals with their own gameplay. Collecting vintage photography can be both rewarding and frustrating. When one can connect an unidentified photograph to a location, time or event, shedding new light on history brings a measure of satisfaction, especially when the photo has never been seen by the public. However, when photos lack any means of identification, they are relegated to merely being an enjoyable, visual artifact. A few of my images were sourced from a veteran’s scrapbook (no doubt, broken apart to maximize the picker’s profits) that after two years of attempting to locate any sort of context, I was able to discover that the game depicted in the images was played by the visiting U.S. Marines in 1943 in Wellington, New Zealand. The inscription of on this photo stated this game was played in China in 1935. Note the band seated behind the backstop as the Marine batter swings at the pitch. Another image of a 1935 USMC game (perhaps a different perspective of the same game as the previous image). One on base being held by the defense during the 1943 USMC game played to a packed crowd in Wellington, New Zealand. In addition to veterans’ scrapbook and snapshot photos, I have added images that were taken by news photographers or public relations personnel for the purpose of sharing positive news to the home front to offset the lists of KIA/WIA/MIA that would dominate local newspapers during the war. These images are typically larger images (some as large as 10-inches) were professionally enlarged (snapshots are normally tiny contact-prints) that are printed on glossy photo paper (specifically during the 1940s). While my photo archive is not extensive by any measure, it does provide a decent perspective on the historical depth of the intertwining of the game within the Marine Corps. This team photo is inscribed “1916 Mare Island” which seems to align well with the uniforms’ design. My card collection has been tucked away since the early-to-mid 1990s until the last few weeks when I dug the 1950s cards in light of the (“my”) Dodgers entry into the 2017 post-season and finally reaching the World Series. Connecting my two collections (military baseball and card collections) has only served to reveal to me that my early interests (card collecting) in the men who also served has transcended to my present collecting focus. USMC intra-squad game held in 1945 on Okinawa. No other details or inscription was provide with this photograph leaving me with no idea if this was before during or after the cessation of combat activities on the island. Thinking back to that set of 1956 Topps cards and the team that was fielded in the 1955 World Championship, it is difficult to imagine the challenging road each player took to get to that point in their professional careers, especially after seeing the horrors of war. Unlike today’s Dodgers roster that does not contain a single military veteran (which holds true for all of MLB), the 1955 World Champion-team from Brooklyn had the following members who also wore the uniform of their nation. Carl Furillo (Army) – Carl served in combat in the Pacific Theater, received three battle stars, and was wounded. Peter Golenbock says in his book Bums that Furillo turned down a Purple Heart medal for his wounds, stating that he hadn’t been sufficiently valiant. Don Hoak (Navy) Hoak enlisted in the US Navy during World War II, on February 27, 1945 towards the end of World War II and only a short time after he turned 17 years of age. On February 21, 1946 as Hoak serving at Pensacola, Florida, his father was crushed when the tractor he was operating overturned, killing him and leaving Don’s mother a widow at home with his 3-year-old brother. That summer, Don was discharged from the Navy. Dixie Howell (Army) – in November 1943, Howell entered military service with the U.S. Army. He served in France and Belgium during World War II and was taken prisoner by the German troops in September 1944, being liberated by advancing Allied forces six months later. He returned to the United States and was discharged from military service late in 1945. Clem Labine (Army) – Labine enlisted Army on December 14, 1944 and volunteered to serve as a paratrooper. Johnny Podres (Navy 1956) – Podres became a sailor in the United States Navy, yet serving his country did not, in any way, diminish his baseball skills — he pitched for Bainbridge Naval Station and Glenview Air Station. The Navy released Podres in October because his back issues made him “physically unfit for further military service.” It was “a form of arthritis of the spinal column. *On the last game of the 1943 season against the Cincinnati Reds on Sunday, October 3rd, Gil Hodges had three plate appearances. He entered the game as a pinch hitter, eighth in the order, taking over for catcher Mickey Owen (who didn’t have a plate appearance). Hodges coaxed a walk from Cincinnati starting pitcher (and future Navy veteran) Johnny Vander Meer and he subsequently stole second base. Ballplayers (probably USMC or USN) take in instruction from Bestwick, their catcher. I acquired this vintage photo of military ballplayers – obviously dirty from game-action on Guadalcanal in September of 1943. The image was a veteran’s snapshot that had to be approved by the Naval Censor (stamped and signed on the reverse). Author’s collection: dated September, 1943. “The one constant through all the years, Ray, has been baseball. America has rolled by like an army of steamrollers. It’s been erased like a blackboard, rebuilt, and erased again. But baseball has marked the time. This field, this game, is a part of our past, Ray. It reminds us of all that once was good, and that could be again. Oh people will come, Ray. Over the course of the 2013 National Football League season, I was captivated by the successful run made by my team, the Seattle Seahawks, champions of Super Bowl XLVIII. I didn’t miss a single game as I was captivated with each win and by all of the individual stories that flooded the local media about the players and the fans. It has never been more evident that the NFL and the Seattle Seahawks represent today’s national pastime. However, I must confess that I am still, first and foremost, a fan of baseball. No other American sport has such a storied history and consistent, lasting traditions. No other professional sport has filled the ranks of the U.S. armed forces to the extent that major and minor league baseball has. Program for the Air Force General Depot No. 5 All Star Classic held on 30 May 1945. Pages 2-3 showing the rosters of the All Stars. Throughout the war, the ranks continued to swell with men who traded their flannels and spikes for OD green and navy blue regardless if they were the games biggest stars or utility players from class “D” ball. 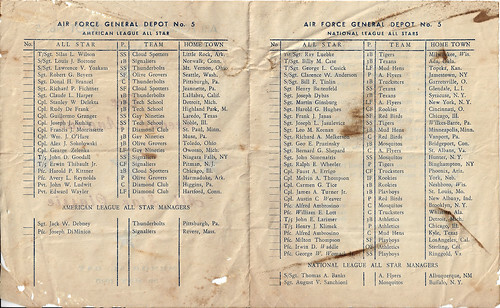 Baseball historian Gary Bedingfield lists (on his Baseball in Wartime site) more than 1,360 (known) professional ballplayers who served in the armed forces during World War II. For a collector like me, the crossover collecting – joining baseball and military history together – adds such a enjoyable aspect to the pursuit both common and unusual artifacts. Some of my most recent baseball militaria acquisitions are in the realm of ephemera (one piece) and vintage photographs (three images) and, though I haven’t started to, pose some interesting research challenges in determining who (if any) might have suited up at the professional level before or after the war. Ernie Raimondi (center) and Dom DiMaggio both volunteered for service in the armed forces during WWII. Raimondi was fatally wounded near Strasbourg, Germany in January, 1945. This vintage press release image shows the two future service members with the (now) defunct San Francisco Seals in 1939. One (recently pulled) online auction for a set of eight autographed baseballs was the stuff of dreams for a collector like me. However, being on a shoestring budget, the asking price was well outside of my financial means and I had to watch it go unsold though the progressively improved with each re-listing of the item. The signatures on each ball had been obtained by a man who umpired service games in Hawaii in 1945. Each ball was filled with autographs from major and minor league stars (some future Hall of Famers) and had been part of a larger lot of balls from a 2008 estate sale. WWII umpire, J. F. Scwendemen WWII military service team baseball collection with dozens of autographs of MLB stars and Hall of Famers (source: eBay image). In the past few months, I have observed a few auction listings for service team uniforms, specifically USMC, that were in considerably bad condition and yet sold for more than I paid for my pristine uniform set, demonstrating that I am not the only collector interested in the baseball-military connection. I do love to wear a jersey on occasion and fortunately for me, I was able to obtain a beautifully-made wool flannel replica of my 1940s Marines baseball jersey. My original is now safe from me potentially failing to keep it safely tucked away in my collection. In conducting a few online searches for baseball-related militaria, I could easily spend a few hundred dollars and have a small collection of items that would provide significant enhancement (to my existing collection) and help to tell the story of the indelible impact that the game has had on our service members, especially in time of war. Dating from the Civil War through to present day, baseball has been constant and unchanging, especially for our service men and women. The game is a part of the American past, present and hopefully for the future and collectors will be there to preserve that history.